Start off the New Year right with your new Commodore, Rosemary Wilson! The Levee is always an extra special event here at KYC. 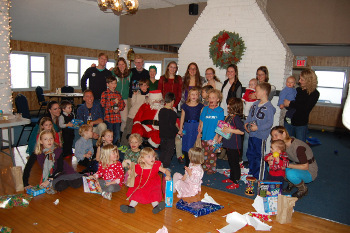 A drop-in event filled with food, beverage and good cheer! Please RSVP to youngpg@queensu.ca by December 20th. What a great Roast Beef Dinner and Carol Sing we had last week at the Club! It was a pleasure meeting more of the membership as well! The Heritage Committee is pleased to announce that the long-awaited "Virtual Trophy Room" is now available at the KYC website. After three years of work, Club trophies may be viewed on line, each with its story and award recipients over the years. Some of the trophies go back to 1895 and many are works of art in their own right. We are clearing out the old tool room on the ground floor of the Saints Rest to make room for archives storage. There are many and varied bits of hardware, plumbing, fasteners, and miscellaneous items to go. Bring a box or bag and take your pick ....no charge! Dates and time: Saturday Dec. 13 and Saturday Dec. 20, from 10.00 - 13.00hrs. Access will be via the JS door near the visitor washrooms. 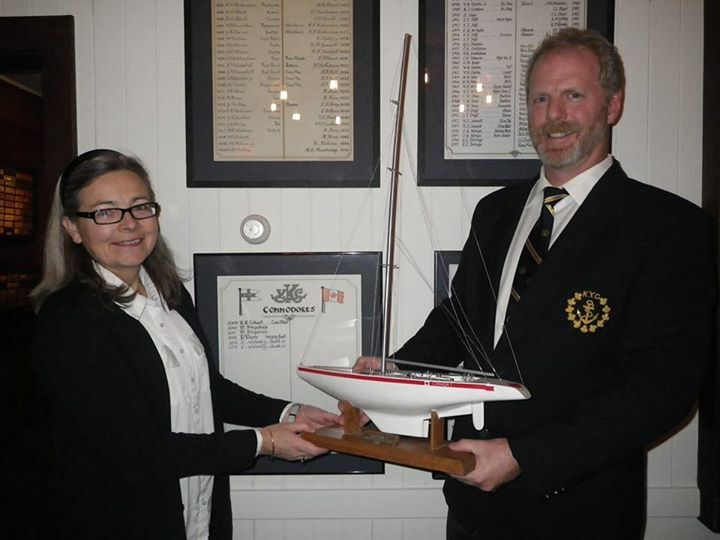 The Canada 1 Award is presented to a member whose actions embody good sportsmanship and unselfish service to the club and to sailing.It is a special award that is not presented annually. Congratulations to Paul Davis on receiving this award. We thank him for his ongoing dedication to the Club and to the sport of sailing. By now, with the renovated bar having been opened just in time for the AGM, most of you have had an opportunity to see and hopefully USE, the bar. As well, we have also completed some reno's to the kitchen. With the completion of these two projects, you now have an "excuse" to sample the delectables on the new menu, while sampling a glass of fine wine or good beer, at your now "ergonomically friendly" bar. Staff will no doubt extol the virtues of these renovations. The buzz seems to be that the bar renos are a smashing success. The driving spirit behind the bar reno was was Terri Hodges, whose vision has come to fruition. Thanks to Commodore Rosemary Wilson for bringing it to the Board and making the case to do the work. Your Club Steward, Brad Strawbridge and his able helper Adrien Noble made the physical work look easy. Brad pulled together the renovation team and the numbers to make it work and he sweated bullets to pull it all off in a short time frame.... he is now, we hope, enjoying the sunshine down south! Valuable contributions were made by your bar, administrative staff and Board Members, including Brett Thompson, James Walton and David Simon, as well as Jr. Past Commodore Chris Walmsley who did the flag graphics, Matt White who figured out what wires to pull, where to pull them, then pulled them! Megaera Fitzpatrick offered some useful tips on various items. I was pleased to provide the general design, to help interpret and realize the vision. A long overdue renovation made possible by a team of dedicated volunteers and staff alike. Please take a look at the before and after pics. We are pleased to say that this project sets the standard for future work. We hope that members use and enjoy these upgraded facilities. Five members of KYC made the long trek (15 hours one way) to attend the Western Challenge Iceboat Regatta on Lake Kegonsa near Madison, Wisconsin. The host club was the Four Lakes Ice Yacht Club and they know how to host a fabulous regatta. The launch site was at Springer's restaurant on the shore of the lake, a perfect venue that offered warmth and great food for all the racers. Attendance at this regatta was amazing – one hundred DNs – yes one hundred – divided into Gold and Silver fleets plus 12 Renegades and five Ice Optis. Friday was light air and ideal for tuning the boats, getting advice from other sailors and enjoying the company of the competitors. Saturday was 8 to 10 knots of breeze which meant that boat speeds reached 40 knots. Trust me, this is plenty fast when you are approaching the leeward mark with three boats right beside you. The excellent race committee got off five races before darkness threatened. This was quite an achievement with four separate fleets to contend with. The race course was traditional windward leeward with the addition of Darling marks that were set 150 yards inside the turning marks. You have to leave the Darling mark to port which prevents people from gybing right at the leeward mark or tacking right at the weather mark and is designed to improve safety. Saturday evening the host club treated the fleet to FREE beer and appetizers at Springer’s and we all had a great time rehashing the day’s racing. Sunday dawned sunny and with more breeze. We sailed 3 more races in 12 to 15 knots. This was full on, pedal to the metal, how fast can I go racing. I didn’t know my mast could bend that far, but it did and the acceleration was mind blowing. Bang the corners as fast as you can and try not to spin out. Apart for the World/North Americans, the Western Challenge is usually the best attended regatta in North America. It is traditionally held on the first weekend in December and is almost always held on fresh black ice. This year’s regatta attracted sailors from around the globe. There were a dozen Canadians including 5 from Nova Scotia (they started driving on the Monday before the regatta) plus representatives from Minnesota, Illinois, Michigan, Ohio, New Jersey, Connecticut, Rhode Island and North Carolina. Then we had the true long distance travellers from Germany, the Netherlands and Sweden. Oh, I should mention the entry fee for this regatta – free. Was it worth the drive? A resounding yes. Have you ever noticed the transformation the yacht basin undergoes after haul out day? Of course the boats are all tucked in under a variety of covers and the whalers are huddled in a group as if to keep warm. That big pile of wooden structures at the end of the breakwater is the beloved T dock where many have enjoyed a cool midsummer swim. The water level falls so fast that it seems like someone has pulled the plug on Lake Ontario and the rock infrastructure beneath the inner basin docks is clearly visible. But why is there a piece of yellow polypropylene line strung across from the end of the floating docks to the breakwater? Did someone forget to remove the little orange marker buoy at the west end of the basin and why is there a mooring buoy at the east end of the basin with no idiot line connecting it to the floating docks? It is the model boat guys! Any of you who drop in to the club on a late Sunday afternoon will notice that there is a small, intrepid group of model boat sailors from the International One Metre Fleet who will just not give up. They have a Frostbite Series and even a trophy to go with it! They are all bundled up in a variety of toques, scarves and ski jackets with mitts and transmitter covers over their radios. You may notice a spray bottle of antifreeze to keep the little string sheets and lines from freezing to the deck. There are always a couple of mooring buoys which will serve as a starting line and the buoys at the ends of the basin complete a windward and return race course. The yellow “safety line” is to prevent any errant boats from getting away. Nobody wants to try to chase down an IOM in that old black rowboat which is now the only access to the water. They start racing about 15:00 and after about an hour, once the sun starts to set and the temperature falls, you will find them in the bar clutching a hot cup of coffee to warm up frozen hands and debating the activities of the afternoon. Soon it will freeze and they will have to stop. After that it is a long winter. You should use the time to find an IOM so you too can join the post season fun and stave off the separation anxiety from having your boat on the hard! But then there was the February in 2004 when a keen IOM sailor in Montreal with cabin fever organized a mid-winter regatta in the Pointe Claire Olympic Pool using a number of 4 foot industrial fans. He was only allowed to use the pool from midnight until 6 AM but 11 IOMs showed up, 5 from KYC, and many races were run. At the 4 AM snack break, the local model powerboat guys arrived and put on a demo of their boats!The same sailor is talking about doing it again this winter. But that is another story.